White Light? Is it the right light? The universal panacea of the spiritual movement. It can do all and everything! Well, maybe not. Like many spiritual concepts and tools it can get over used, mis-used or lost in translation. Don’t get me wrong it should be in your spiritual and energetic toolbox but use it wisely. Firstly, what is it? And here comes problem number one. Different people see it as different things. Hence the word universal in the opening line. Ask yourself what is it to you, do you even know? Are you, in fact, using it because someone else told you to. For me, white light is a definite energy. It comes from and is part of the Spirit realm. Please note, the Spirit realm and the Universe are two different things. The Spirit realm is the plane of existence where your Soul comes from and will return to. It is pure energy, with no matter. This is where Spirit reside in pure conscious energetic form. White light is the substance that binds them together, exists in space between them and is of them. Their collective energy if you like. It can be sent by them to assist us. Or we can call it in as we are part Spirit. White light is pure and clear. We can use white light for healing, clearing, expanding or as part of the opening up process. 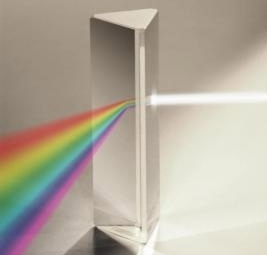 As the prism shows, white light can be split into the various colours. This is what it does when healing but in reverse, where it brings dis-harmonious energy back into alignment as one harmonious energy. I often come across people who are protecting themselves with white light. Surrounding their aura with it. However, the is not protective. In fact is can create the opposite effect. Negativity is attracted to the light, not repelled by it. Bit like a moth to the flame. If you want to use a coloured light for protection try dark blue. My favourite visualisation and the one I share with my clients and students is to imagine the outside of your aura as mirrored (think 1970’s Disco Ball). Negativity is reflected away from you by the mirror. Often students use white light when they are grounding – seeing their roots as white, or the energy of Mother Earth as white or indeed even bringing white light down from the Spirit through the crown chakra and then into the Earth. White light is weightless. When we use the word Light it is in both senses of the word – luminous and weight. Where white light is faster moving than we are it can in fact unground you rather than ground. I encourage my students to consider their base chakra also known as the root chakra – what colour is it? Red. It is called the root chakras as this is the where you ground from. Therefore, using the colour red for your roots and the energy of Mother Earth coming back into you is more grounding than white. Another problem I find is that students don’t know the colours of the chakras. Many times they say their crown chakra is white. No, it is violet. When you envisage your crown chakra as white you are in effect over stimulating it which can lead to you being too open and struggling with clarity. If you look at the colours of the chakras there is a logical order – based around how colours merge – Red & Yellow makes Orange, Yellow & Blue makes Green, Blue & Violet makes dark blue – think back to the prism. 4. Balancing your own energy (for instance you have too much physical energy or red energy and need to lighten up). White Light is combination of all colours, as we see colour. Don’t forget all the other colours; they are equally useful and potent. Blue and Green are very healing and calming. Pink can help with giving and receiving love (especially for self). Yellow can strengthen your free will and confidence. Orange can assist with emotions and creativity. Violet is good for Spirit communication. When cleaning your chakras using the colour associated with that chakra is often more suitable than using white. Remember white is very fast moving and can create expansion. Your chakra might need calming rather than stimulating. When grounding you might brown for your roots more soothing than red, especially if you are very connected to nature. We live in a world of colour. So don’t be monochrome when working with Spirit and Spirituality. We are Spirit but we are also human and our body is physical matter. Physical matter resonates with colour. If we over use white light we will run the risk of devaluing it or neutralising it. We can become complacent. Keep white light in your toolbox along with all the other colours. Use your own instincts as to what colour to use. Ask your Spirit Guides or Soul if you are unsure. Then when you do use white light it will be all the more poignant.